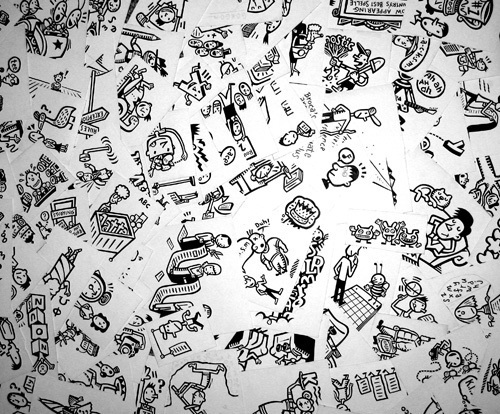 100 drawings (count em) had to go to final art in about 6 days, here. The sketches were laying around for weeks. Great art director, great client. Circumstances conspired against us all in the end-game. I'd like to recommend 100 final drawings in six days to the CIA as a sure fire way to turn a completely and otherwise rational man into a blubbering grease spot of his former self. He will, by day six, tell you anything you want to know. The method comes complete, with a customary bright light focused on the subject day and night. Last minute changes to finals are suggested to create further distress and self-doubt . Our national security folks should know: You will break any man, he will tell you anything you want to know using this cruel but completely acceptable method of gathering important intelligence. Yeah, grrreat job. I wouldn't mind seeing a lot more of these close up. And some clue as to what character needs 100 spots in 6 days would be good. Sounds more like a reality tv show to me than an assignment. Thanks all - This stunt was performed by a seasoned professional and should not be attempted at home without proper training.